At the moment it's the only database that provides correct average values for all item attributes, other tools/wikis rely exclusively on data in .dbr files ignoring attribute scaling (here is an example of what I'm talking about). The names of factions, names of item sets and set items shown on item cards are clickable, making it a bit easier to navigate. Plus item card formatting is the same as in the game. 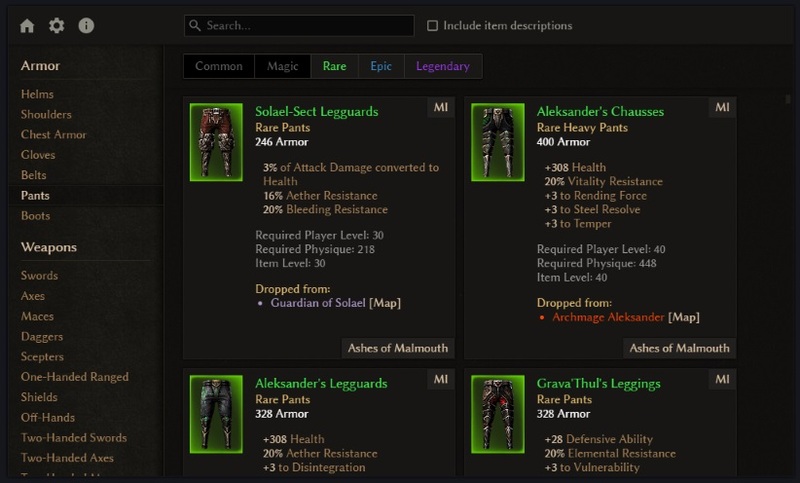 You can search by item / item set / affix names or by their descriptions if "Include item descriptions" checkbox is enabled. The search is not strict by default, so searching by "to all skills" will yield items that give + to all skills in a mastery or all of them (e.g. "to all skills in Soldier" or "to all skills"), however you can use "$" symbol which acts as a line break, i.e. "to all skills$" query will return items that give "+ to all skills" in all masteries only. You can search for several strings by putting them in quotes and separating them with a space, e.g. entering ["% fire damage" "converted to fire damage"] (without brackets) will return only those items that provide fire damage modifier AND convert some type of damage to fire. For now there's no advanced filtering at the moment, only by rarity. But you can use extended search to find virtually anything you want. There's a lot of unobtainable stuff in there that also isn't on Shalie's db. Mostly higher-level stuff. On a sidenote, Crate really should add more Lightning Medals, be it Rare or Epic. Well, all the stuff in my db is "obtainable" in game, but I intentionally put this word in quotes to emphasize the fact that it can be obtained in game, because all the items are in loot tables of some mobs / loot containers that are actually spawned by some proxies or spawned via quests/events, but there's no way of knowing if an item can actually drop in current game state (considering player level cap / currently available areas / quests / events). I think my GD resources crawler is pretty good at finding "obtainable items", but there are some limitations that it can't overcome, like knowing which quests/events can be currently triggered or which proxies are used, so it assumes that all of them are needed. Of course it's not perfect - there are at least 2 items which my crawler finds, but I'm pretty sure these are broken, so they are implicitly excluded from the db. Regarding a lot of high-level stuff that's missing from Shalie's db, he stated couple times that he doesn't update it after hotfixes, and there was a lot of high-level epics included in hotfix 2.
there was a lot of high-level epics included in hotfix 2. Wasn't faulting you for anything, I think it's a great tool and honestly I wasn't far off myself from building something similar. Just giving a bit of a spoiler warning. A great idea, but I would appreciate if you took Shalie's approach to omitting items that are not available in the current state of the game. To be honest, I wanted to do exactly that, but if I ignore all items spawned by quests, this means that not only quest items but also all quest rewards will be excluded, because there's no way to differentiate available quests from unavailable ones :/ Is it OK if I only remove quest items which aren't yet in the game and keep all quest rewards? Eager to see these new Nemesis spaulders! Updated to 1.0.0.2, sorry for the delay.